There are precious few cultural icons as important as McKinley Morganfield, better known to most people as Muddy Waters. 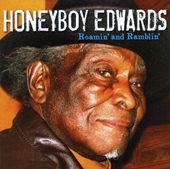 Blues legend David "Honeyboy" Edwards is one of the last of the original Mississippi Delta bluesmen. Riding the rails during the 1930s as a hobo, Edwards shared the road (and the stage) with fellow legends like Robert Johnson, Howlin' Wolf, and Sonny Boy Williamson. Now Edwards is adding another accolade to the many that he's received through the years with his induction as one of six new members to the Mississippi Musicians Hall of Fame. The Hattiesburg American newspaper website has a great story on Edwards' long-overdue induction as well as a brief interview with the still-performing bluesman. Blues guitarist Duke Tumatoe has survived over 40 years in the music biz, a remarkable feat by any measure. The veteran musician has performed alongside such greats as Muddy Waters, B.B. King, Bo Diddley, and Willie Dixon, and he was an original member of 1980s-era rock heroes REO Speedwagon. Thanks to his original songs appearing on the syndicated Bob & Tom radio program, Tumatoe is reaching more new fans than ever. The Indy Star newspaper has this Duke Tumatoe interview, the Q&A done by writer Zach Dunkin. It's been a decade since young blues guitarist Shannon Curfman floored blues fans with her brilliant 1999 debut album Loud Guitars, Big Decisions, released when she was a mere fourteen years old. A lot has happened in the ten years since then, with Curfman attending college, getting engaged to and breaking up with blues guitarist Kenny Wayne Shepherd, and recently ending her major label relationship with Arista Records. Jessica Steinhoff of the Isthmus website has this brief interview with Curfman about her new album, Fast Lane Addiction, and recent tour. Finally, our friends over at The Delta Blues blog have this informative post on the discovery of Robert Johnson's death certificate. Much about the life of this blues legend is shrouded in mystery, and this story will do little but stir up more hypothesis about Johnson's demise, but it’s a lot of fun nevertheless! Texas blues guitarslinger Smokin' Joe Kubek and his axe-wielding partner Bnois King are preparing to hit the road again after a brief respite, touring in support of their 2008 Alligator Records release Blood Brothers. While the critically-acclaimed album has earned the duo a Blues Music Award nomination for "Rock Blues Album of the Year," the band's blend of houserockin' roadhouse and soulful blues has won them a constantly-growing base of fans for almost two decades now. This is one tour that you won't want to miss when it comes 'round your way. We're going to open the new year by looking at the latest issue of Blurt magazine, which does a fine job of covering blues music in all of its many varieties. Available as a bi-monthly "digizine" in Flash and PDF formats, Blurt is also a music webzine, updated daily with news, reviews, and a slew of music videos. As this list of recently published CD reviews shows, Blurt has a handle on the kind of music that we like to hear: blues, blues-rock, rhythm & blues, and soul. Stop by and see them sometime, and tell 'em the Reverend sent you! 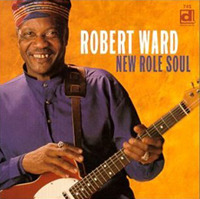 Blues Guitarist Robert Ward, R.I.P. Blues guitarist Robert Ward, nicknamed "The King of the Magnatone" for his inspired use of the amplifier's unique sound, passed away on Christmas day at the age of 70 years old. Ward had suffered from health issues for years, including a stroke in 2001. Born in poverty in rural Georgia, Ward first picked up the guitar at the age of ten, inspired by the records he heard from blues artists like B.B. King and Muddy Waters. After a hitch in the Army, Ward returned home in 1959 and joined his first band. Unsatisfied, he moved to Ohio in 1960 and formed the Ohio Untouchables, which would later become the Ohio Players after Ward's departure in 1965. The Untouchables recorded a string of early-60s singles for various indie labels, each song featuring Ward's amazing vibrato-soaked fretwork. The band backed Wilson Pickett and the Falcons on the sessions that yielded their 1962 hit "I Found A Love." After leaving the Untouchables, Ward would record a number of singles for labels like Groove City. During the 1970s Ward worked as a session musician for Motown Records, playing behind virtually all of the Detroit-based soul label's artists, including hitmakers like the Temptations and Undisputed Truth. When his wife died in 1977, though, Ward hit upon hard times and would return to Georgia where he disappeared for a while. In 1990 Ward re-emerged with a label deal with Black Top Records, delivering the soul-blues classic Fear No Evil. Ward would subsequently record three more albums for the label during the 1990s with varying results, and in 1995 a collection of his early-60s work titled Hot Stuff was released by Relic Records. In 2000, Ward signed with Delmark Records, which released his final album, New Role Soul, to critical acclaim. An underrated vocalist and songwriter, Ward has come to be recognized as a skilled and imaginative blues and soul guitarist whose talents helped create some of the classic music of the 1960s and '70s. Your offer for BluesMusicNews.com should reflect market value. Offers below $1000 US are ignored.